Sunday UPDATE: "Won't be shocked to type "tanked" come Sunday." Those words proved deadly accurate as Transcendence tanked in utterly-epic fashion, barely clearing the $11M mark, accomplishing what precious few films – not After Earth, R.I.P.D. or Depp's own The Lone Ranger – accomplish: post an opening weekend Friday-to-Saturday freefall of -20%. Brutally bad. Defeathering Rio 2 once again, Captain America: The Winter Soldier made it a three-peat, down just -36%, taking its worldwide cume to $586M and counting. In third, Heaven Is for Real became the latest faith-based phenom, taking full advantage of Easter weekend with an impressive 5-day total of $28.5M. As for the weekend's other newbies, A Haunted House 2 did half the business of its 2013 predecessor and Bears hibernated in eleventh place. The Lone Ranger was drawn and quartered. Dark Shadows disappeared. The Rum Diary drowned. For a guy who’s purportedly one of the most bankable stars in all of Hollywood, over the past few years, Johnny Depp has a dubious box office record at best. 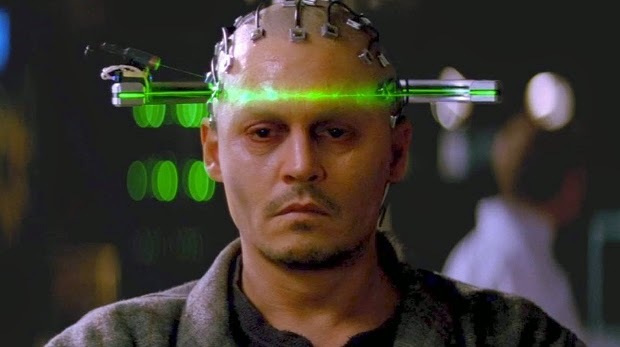 Yes, dude’s done nearly $3B in business worldwide since 2010, but 73% of that cash – trust me on the math – came from Alice in Wonderland and the most recent of the 78 Pirates of the Caribbean sequels — Depp's draw is dependent on the material. That fact doesn't bode well for the 50-year-old this weekend with the arrival of Transcendence, the Christopher Nolan-produced, trapped-in-a-computer sci-fier (something along those lines) whose trailer drew a mixture of laughs and yawns ahead of one of my recent screenings. There’s a reason Depp’s been yakking incessantly about that rather feminine engagement ring to anyone who'd listen — unmitigated desperation. Rio 2 $23M - Could see bigger second-weekend drop than your typical animated offering due to combo of good weather and mediocre quality. Captain America: The Winter Soldier $19.25M - Just hit $500M worldwide, on track to surpass $600M. Transcendence $19M (↓) - Won't be shocked to type "tanked" come Sunday. A Haunted House 2 $17M (↓) - Taking the high – high – end of expectations as a courtesy to Marlon Wayons for his ungodly promotional blitzkrieg. Heaven Is for Real $16.5M (↑) - Opened with $3.4M Wednesday, setting up yet another faith-based sensation. Bears $7.5M (↑) - Wreck-It Ralph narrates Disneynature's latest to-the-ends-of-the-Earth furry adventure.